Updated 4:07 p.m. with additional details, comments, application and resume attachments and photo. NORWALK, Conn. – The Norwalk Board of Education has revealed the name of its top candidate to be the next superintendent of schools. Dr. Steven J. Adamowski has been chosen to lead the Norwalk Public Schools and to press forward with reforms instituted by Manny Rivera, who left in January to accept the top job in New London. 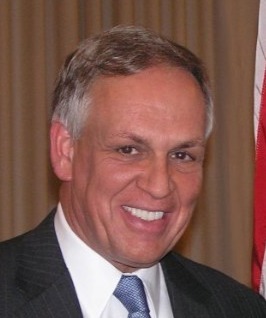 The former Superintendent of the Cincinnati and Hartford Public Schools (with 38,000 and 24,000 students, respectively), he was named Special Master for the State of Connecticut Department of Education in 2011, providing state supervision and support to challenged school districts, according to the NPS press release announcing the choice. Subject to approval of his appointment by the Board on June 16, Adamowski will begin his term as superintendent on July 15. Interim Superintendent James Connelly’s contract has been extended two weeks to cover the gap, according to BoE Chairman Mike Lyons. Connelly’s contract calls for payment of $965 a day. He began work as a consultant Jan. 19 in advance of Manny Rivera’s last day on Jan. 31. Adamowski was chosen from a field winnowed down from 11 candidates by way of Skype and in-person interviews. The candidates were recruited by the search firm PROACT. Adamowski’s identity was to be revealed June 9 at a Board of Ed meeting at which the full board would vote on the choice. However, the vote was delayed until Tuesday, June 16, because of a Norwalk Federation of Teachers contract clause that allows the union four days to vet the choice before it goes to a vote. The fact that the union was given the name played a part in the public getting an advance look. “We felt that if the union was entitled to get the information today, we saw no reason everyone else shouldn’t get it today, too, so we released it to everyone simultaneously,” said Lyons. Dr. Adamowski shares the Board’s commitment to building a school district of excellence for the 21st Century, one that truly embraces diversity and the goal of success for each and every student. He has committed to staying in Norwalk for the long term, and to full support of the Strategic Plan adopted by the Board with former Superintendent Manny Rivera. We believe that he will bring to his Superintendency all the talents and values that the Board looked for in the lengthy search we conducted with PROACT. Prior to Hartford, Dr. Adamowski served as Senior Fellow and Managing Director of the American Institutes for Research (AIR) in Washington, DC, where he focused on assisting urban school districts to improve their effectiveness. He joined AIR after serving as Superintendent/CEO of the Cincinnati, Ohio Public Schools, where he led a massive redesign and decentralization that pioneered the development of small, themed high schools and produced dramatic gains in student outcomes. Dr. Adamowski also served as Associate Secretary of Education in Delaware where he played a key role in that state’s early education reform efforts. He currently teaches a course on Data-Based Decision Making for Superintendents in the University of Connecticut’s Executive Leadership Program. Dr. Adamowski holds an M.A in Education from Trinity College in Hartford and a specialist degree in Administration, Planning and Social Policy from the Harvard Graduate School of Education. He earned his PhD in Educational Administration from Saint Louis University in Missouri. This is really GREAT NEWS FOR OUR CITY!! I want to Thank the members of the BOE for there due diligence in picking a great future superintendent that will be here for the long run! I am looking very forward to meeting him and full Board Supoort on his approvals vote Tuesday night! Well Done! Please BOE members. Do the right thing. Give your unanimous vote and support to this guy. Show your respect and appreciation for our votes that elected the nine of you. Equally troublesome is Adamowski’s free hand with the state’s check book. Great job to BOE, its Chairman Mike Lyons, and also PROACT. Sorry MarjorieM. This looks like a great choice, and we should all be supporting the new superintendent. Let’s hope the entrenched status quo interests in the school system and the toxic troublemakers on the BOE can step out of the way and let him do his job — please don’t frustrate his efforts and chase him out of town!! I am fully willing to give credit to Mike Lyons. He will take full responsibility for this superintendent. No problem! Is this the same guy that was just hired??? Yes. But he won;t be hired until after the vote Tuesday night. If I’m reading the article right (and please correct me if I’m wrong) the person who for all intents and purposes helped pave the way for our last superintendent to get his new/previously held job is now getting our last superintendent’s job? Hmm. There might be some fine print worth reading. I would be interested in reading the position papers Mr. Adamowski put his name onto while working at the Hudson Institute. This is correct. FYI, I’ll be putting up another story with some links to stories from various publications — some news, some opinion — later tonight. Some of the links have already been posted in comments, but I’ll try to give then a bit of context. Wow! How many of you remember Victor Herbert and all the controversy that followed him? Not a good start. Sure hope this guy has a long successful career in Norwalk. We can’t afford another set back. Marj, Pelto is a left-wing politician who’s never met a big government spending program he didn’t like. To cite his fairy-tale like blog as a source criticizing Dr. Adamowski as a big spender is actually amusing. Look, if Pelto and Marj (both big supporters of the education status quo) are against Dr. Adamowski, those are two big reasons to support him. Mike, I noticed you only criticized one of my articles. Would you care to respond to Rivera being involved in Adamowski’s appointment? How about the Stamford Advocate’s article? That’s two items I am asking about…..
Oh dear. Is this the man who cut back on early childhood education in Windham? Didn’t he also use Teach for America recruits (with only 5 weeks of training) to staff schools? He appears to have a lot of ties with very conservative anti-teacher groups. I have also heard about some funny accounting when it comes to gauging “improvements” in test scores. Too bad. MarjorieM […] – you really need to give it a rest. Let’s give him a chance and not already start with the destructive behavior. Amazing how a few bad apples for the city of Norwalk really can stop us form moving in a positive direction. If you haven’t been paying attention – the parents in this city are done with it. If you don’t have something positive to add – just SHUT UP!!!!!!! This post was edited to remove an erroneous assumption about the true identity of another commenter in violation of our policy. I’ve read some good comments and some concerning comments about Dr. Adamowski. If you tell me that you and the BOE have truly investigated both the negative and the positive claims about Dr. Adamowski, I will take you at your word. As you must expect, the taxpayers will also hold you to that word. I know that there are people who post here who are most often at odds with you and your thinking, but I want to believe that you will listen to and seriously consider what they are saying. Please keep your minds open. After that, we must leave the decision to the BOE. To those who assume that it is necessarily good that the NFT leadership seems to hold Dr. Adamowski in disfavor, I say only that the BOE has the responsibility to listen to what the NFT believes as well. The NFT doesn’t get a vote, but it should be afforded the respect of having the BOE listen to its opinion. Again, however, the vote is the BOE’s. On another note: Given the experience this man has had and given the very brief time that James Connelly has been here, why is it necessary to spend $965 per day for more than two weeks? $965 per day is a lot of money, and I can’t imagine that Mr. Connelly has so much to say that he can’t say it in ten working days. He and Dr. Adamowski should already be communicating by telephone and email. I don’t expect to attend Tuesday’s meeting, but I will be eager to read about it. I wish you and the members of the BOE the wisdom to make the very best decision. Marj, Rivera wasn’t involved in Adamowski’s appointment (not that I would have had a problem if he had been). Adamowski was one of 11 candidates brought to us by Proact, and was the choice of the Board after two rounds of interviews and full background checks. The ‘article’ you cite in The Advocate isn’t a news article, its an opinion piece written by another anti-reformer. Look, I get it — the defenders of the status quo in education don’t like Adamowski, just as they didn’t like Rivera, Pryor or even Malloy. The status quo is not acceptable to the Norwalk Board majority. We have a strong Strategic Plan that we believe can bring significant improvements to the quality of education in Norwalk, and in Adamowski we believe we have a person strong enough to implement it and make it work. John Levin, I haven’t located any papers Dr. Adamowski did while at Hudson (he actually worked on their Modern Red Schoolhouse reform design), but this article mentions his time there and his experiences in Cincinnati:https://books.google.com/books?id=5-0CAAAAMBAJ&pg=PA107&lpg=PA107&dq=hudson+institute+modern+red+schoolhouse+Adamowski&source=bl&ots=qW3WWzZvQk&sig=nRhq0w8p8zHfVvaQ3zYxYViZZGk&hl=en&sa=X&ved=0CEAQ6AEwBmoVChMI4cPLtd2LxgIVikOSCh0-sQA5#v=onepage&q=hudson%20institute%20modern%20red%20schoolhouse%20Adamowski&f=false. We have. Board members have read and discussed critical news articles about Dr. Adamowski as well as positive ones. These were considered by the Board before it decided to offer him the job. Agreed. I talk regularly with NFT President Mellion, and arranged a meeting with him and Dr. Adamowski before the announcement of the choice was made. We are maintaining a positive dialog. It may not be; as I stated in the article, that’s something we would do only if considered advisable after consulting with Connelly and Adamowski. The cost is trivial against a $171 million budget. Wow, telling tax paying concerned citizens to “SHUT UP”, a new low for Ms. King, Shut up yourself Nora! A little too much “Chiramonte” in your soda pop today I would guess! this guy should fit right in! anyone else concerned about the fact that Windham County is the POOREST county in CT??? Well, Norwalk, you reap what you sow. Thank you PROACT and BoE members for your hard work that resulted is the selection of Dr.
Steven Adamowski as the top candidate for NPS next superintendent. I’m amazed by how well his qualifications fit with what NPS needs! He is a DATA Driven Decision Maker and this is his passion. Making data driven decisions is a NPS weakness and it’s a systemic issue that NPS lacks good data systems and implementation of ones in place, including required data. NPS is known for having no data in situations where it is required. All educational decisions need to be data driven, this being his passion he will work to improve Data systems issues and make decisions based on real data. That’s the only way to make sound decisions in education. He worked as a Superintendent in the Hartford Public schools so he knows Connecticut Laws, guidelines and educational systems better than Dr. Rivera who came from NY. Hartford is one of the most challenging systems in the state if not the most and so is Norwalk. Hartford is an urban district with 93% of students in poverty. NPS is estimated at 50% and is largely urban as well. Hartford is the largest district in the state and has been chronically plagued with low performance. During his time in Hartford his focus was on closing the achievement gap and as a result student standardized test scores rose by record levels over four years when he was there. Hartford is close to being 100 percent minorities and always has been. The Sheff vs. O’Neil case was in Hartford. He obviously served the minority population well in Hartford and will do the same for NPS. Hartford is also known for having its own aggressive hostile independent Unions just like Norwalk. His experience in dealing with Hartford Public schools and their Unions will be very helpful for working in Norwalk. They are both large tough districts with independent bullying Unions and entrenched status quo cultures. He has proven success in Hartford and God bless him he is willing to come to Norwalk. In fact he was so successful in Hartford the state selected him under Steven Pryor to be a “special master” which allowed him to step in to help save failing districts like Windham and New London. Ironically the place where Dr. Rivera is now. In addition to Connecticut schools he worked successfully in some of the most challenging districts around the country. He will bring that experience here. He is a true academic intellectual and an experienced teacher which shows he has a passion for educating students. He has a stellar educational background and holds numerous degrees, additional credentials and has been recognized with a host of prestigious awards. He attended both Connecticut and private higher Ed institutions such as Trinity College, Harvard and more. So he is familiar with CT higher Ed and additionally the best in the country. He is happy to implement Dr. Rivera’s plan so we don’t repeat having to create a new plan and losing time. He recognizes it was a great plan and it philosophically aligns with his own ideas and focus on closing the achievement gap. He like Dr. Rivera is a reformer and that’s exactly what NPS needs. No wonder Bruce Mellion, head of Norwalk Teachers Union in The Hour expressed some concern about him and his taking over failing school districts. Mellion thinks Norwalk isn’t a system that needs taking over. I disagree with Mr. Mellion we are dam close to needing a take over given our history. Mr. Mellion himself would like to take over NPS and has too much power. For far too long this district has put the needs of adults over students. Dr. Steven Adamowski will see the focus is back on students. No surprise that insubordinate status quo administrators like MarjorieM are freaking out and looking to discredit him. Dr. Steven Adamowski’s selection is great news for Norwalk. I hope to see parents turnout in support for the BoE vote on Tuesday June 16th. See you there! Good Luck Dr. Adamowski! @norwalklifer. At least Nora and myself have enough stones to post hear and NOT hide behind an alias! […] And she has a major point that it is time for […] the obstructionists to SHUT UP already. The same people with the same nonsense, negativity & make false accusation is OVER! The Tax Paying Concerned Citizens as you say have had ENOUGH! We need to FULLY SUPPORT our new Superintendent and continue to moving this district forward. As Dr. Rivera said numerous times when he was here: The Old Norwalk Way doesn’t work anymore, either get onboard the train or get hit by it! The future for this City and district is bright and we will not tolerate people anymore who try to sabotage it! This post was edited to comply with our policy against personal attacks against other commenters. This post was disallowed for violating our policy against personal attacks against other commenters. It would be nice of people were a little most cognizant of their own grammar, spelling and punctuation here – especially when commenting on the school system! OOPS, even I did it – it would be nice IF – but in my defense, I was thinking more of some serious grammatical errors up there. It’s hard typing on a iPhone into a little box to comment especially if yours eyes aren’t so great. Many people are lousy at spelling and grammar. it’s the message and sentiments that count. Mr. Pelto, while I have concerns over Adamowski’s past history, we have been told that Adamowski’s certification is valid. There are those who want to protect the status quo and the school administrators and the long-tenured teachers, on the one hand, and those who are primarily concerned with the students, the effectiveness and reform of the school system, and the interests of the community, on the other. Pick your side, but despite the power of the public employee unions and the politicians in their hip pocket, let’s hope the latter win out, for all of our sakes. And let’s give the new superintendent both a chance and the support he will need to maneuver the dysfunction and opposition he will face. Good job, BOE! How funny! Teachers with current certification, who currently work with children, and get PD regularly on Common Core are being told they are not “highly qualified” enough to teach students what they need to know for the 21st century jobs of the future. Yet a teaching certification from the 70’s is ok? Marjorie M I tried to explain the law, as I understand it, on the other article. At this point Mr. Adamowski CAN NOT work in a Connecticut school because he lacks the necessary certification – but there is a process the TOWN can use to get that requirement waived. To me the question is this. Adamowski had Connecticut certification. 55,000 other teachers and administrators have it as well – some are good, some are not so good and some are bad – but all participated in professional development programs to keep their certification, all paid for their certification and renewed certification as required by law, all did the legal things required of keep their certification in “good standing.” But not Adamowski. And even more incredible is that knowing he couldn’t participate in the teacher pension program Adamowski failed to make any effort to become re-certified – a process hundreds of people do every year. At any point he could have taken the necessary steps to become certified again. There are even alternative routes to get a certification. And he simply did not do what was necessary and legally required to work in a Connecticut school and get a Connecticut teacher pension — even though he wanted that pension and apparently wanted to work as a superintendent —- why? We would never let a doctor work without their license whether they had natural talent or not.